But most exciting of all is the fact that three of these rocky exoplanets orbit within the star’s habitable zone (aka. “Goldilocks Zone”). This means, in effect, that these planets are capable of having liquid water on their surfaces and could therefore support life. As far as extra-solar planet discoveries go, this is without precedent, and the discovery heralds a new age in the search for life beyond our Solar System. The team behind the discovery was led by Michael Gillon, an astronomer from the University of Liege in Belgium. Using the The Transiting Planets and Planetesimals Small Telescope (TRAPPIST) telescope at the European Southern Observatory’s (ESO) La Silla Observatory in Chile, he and his colleagues first noticed the presence of three planets in the TRAPPIST-1 system in May of 2016. The team made their observations of this star system – which is located about 39 light years from Earth in the direction of the Aquarius constellation – from September to December 2015. This discovery was immediately followed-up using several ground-based telescopes, which included including the ESO’s Very Large Telescope, and the Spitzer Space Telescope. Data from these surveys confirmed the existence of two of these planets, and revealed five more – making this the largest find around a single star in exoplanet-hunting history. Relying on the Spitzer data, Dr. Gillon and his team were also able to obtain precise information on the planets using the transit method. By measuring the periodic dips in TRAPPIST-1’s luminosity (from the planet’s passing in front of it), they were able to measure their sizes, masses and densities. This is especially important when studying exoplanets. Not only does it allow scientists to make accurate assessments of a planet’s composition (i.e. whether or not its rocky, icy, or gaseous), it is key in determining whether or not a planet could be habitable. It was also the first time in which accurate constraints were placed upon the masses and radii of exoplanets using this method. A follow-up survey was then mounted with NASA’s Hubble Space Telescope to study the three innermost planets and look for signs of hydrogen and helium – the chemical signatures that would indicate if the planets were gas giants. Hubble detected no evidence of hydrogen and helium atmospheres, which only strengthened the case for these planets being rocky in nature. Nikole Lewis, the co-leader of the Hubble study and an astronomer at the Space Telescope Science Institute, was also on hand at the NASA press briefing where the findings were announced. There, she shared information that was obtained by the Hubble Space Telescope. And as she explained, of the three worlds that are in the habitable zone – TRAPPIST-1e, f, and g – all experience conditions that are very similar to what we experience here on Earth. TRAPPIST-1e is the innermost of the three exoplanets. It is very close in size to Earth, and receives about the same amount of light as Earth does – which means temperatures are likely to be very close to Earth’s as well. TRAPPIST-1f, meanwhile, is a potentially-water rich world that is also likely to be the same size as Earth. It has a 9-day orbit, and receives about the same amount of sunlight as Mars. The outermost of the habitable zone planets is Trappist 1g. With a radius that is 13% larger than that of Earth, it is the largest planet in the system, and receives about the same amount of light as a body positioned between Mars and the Asteroid Belt would. Between these three exoplanets, and the four others in the system, astronomers now have a multiple candidates within the same star system to study what potentially-habitable worlds might look like. During the course of the NASA press briefing, Dr. Gillon stressed why the discovery of this system is a major boon for astronomers and planetary scientists. Not only is this the first time that so many exoplanets have been discovered around the same star, but the fact that it is a red dwarf – a class of small, cooler, dimmer stars – is especially encouraging. Compared to other classes, red dwarfs (aka. M-class stars) are the most frequent type of star in the Universe – making up an estimated 70% of stars in our galaxy alone. On top of that, the TRAPPIST-1 system is rather unique. As Gillon explained, the planets are in close enough proximity that they gravitationally interact with one another. Their proximity would also make for some excellent viewing opportunities for a person standing on the surface of one of them. In the coming weeks and months, NASA plans to follow-up on this system of planets even more. At the moment, the Kepler space telescope is studying the system, conducting measurements of minuscule changes in the star’s brightness due to transiting planets. Operating as the K2 mission, the spacecraft’s observations will allow astronomers to refine the properties of the known planets, as well as search for additional planets in the system. In the meantime, Dr. Gillon and his team will be using ground-based telescopes to search 1000 of the nearest ultra-cool dwarf stars to see if they too have multi-planet systems. Nikole Lewis indicated that Hubble will be conducting further observations of TRAPPIST-1 in order to obtain information about the planets’ atmospheres. These studies will determine what gases make up the atmospheres, but will also be looking for tell-tale signs of those that indicate the presence of organic life – i.e. methane, ozone, oxygen, etc. The Spitzer Space Telescope will also be trained on this system in order to obtain follow-up information on the planets’ atmospheres. Besides looking for biological indicators (such as oxygen gas, ozone and methane), it will also be trying to determine the greenhouse gas content of the atmospheres – which will help put further constrains on the surface temperatures of the planets. On top of that, next-generation missions – like the James Webb Telescope – are expected to play a vital role in learning more about this system. As Sara Seager – a professor of planetary science and physics at MIT – explained in the course of the briefing, the discovery of a system with multiple potentially-habitable planets was a giant, accelerated leap forward in the hunt for life beyond our Solar System. Artist’s impression of the view from one of the exoplanets discovered around the red dwarf star TRAPPIST-1. Credit: ESO/M. Kornmesser. Totally amazing. Is the planetary illustration to scale? If so, those planets are really close and not a whole lot smaller than the star. The top pictures look to scale. The star is around the same diameter as Jupiter, and so the planets look right. The distances are compressed. The orbital synopsis, no. It’s just used to show the states of water: vapor near, liquid, and finally ice. The main question I have is how stable is this star? These planets are in so close that a flare star would likely burn off their atmospheres long before life would get a chance to start. This is also my suspicion. Why are there no gas giants at all there, and all these rocky planets? Could they be the remaining cores of gas giants that had all their atmospheres burned or blown off in superflare event in their sun a billion years ago which then returned back into a senescent old age? It’s my recollection that (ordinary) flaring has been recently found to be uncomfortably common in red dwarfs, perhaps making RD’s poorer candidates in Drakes’s law. It’s possible this is not a life-bearing system at all, but a corpse that literally committed suicide by immolation. Just the bones remaining. Red dwarfs are now believed to be flare-prone. This does not mean they are nova-prone, there is not enough gravity to sustain a fast-burn phase for rapid fusion or fission. While this certainly is a fascinating discovery, I think all the talk of finding Earth 2.0 is rather overblown to say the least. 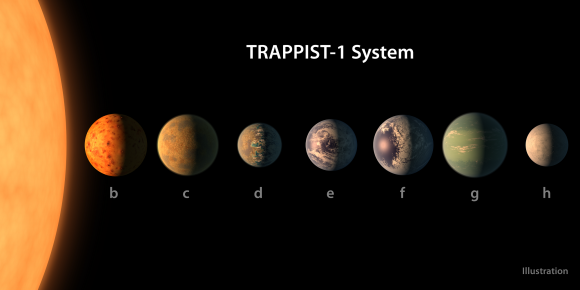 There’s practically no chance that a life-bearing planet orbiting a red dwarf star, let alone a particularly small and cool one like Trappist-1, would be even remotely Earth-like. If there so close they look as big a the moon could they be effecting each others orbits. Trading positions in some type of elegant repetitive ballet.